I was attracted by the packaging ~~!! Anna Sui products all have the signature rose scent, because Anna Sui herself is a big fan of Roses! 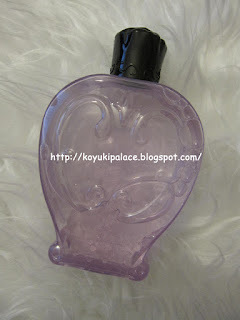 The Anna Sui Eye Makeup Remover has a very girly and elegant packaging. I have tried several eye make up removers and the ones that work to remove heavy eye make up all have 2 layers of liquid in the bottle! You MUST shake the bottle well before use, the 2 layers must mix well before application. It can remove basically ALL eye makeup such as waterproof mascara, liquid liner, heavy eyeshadow. It performs like the Lancome Bi-Facil Double Eye Make Up Remover. these are almost the heaviest mascara you will ever see! This eye make-up remover does a good job removing them!! However, you do have to wipe it a few times before you get everything off. How to use an eye make up remover? - the eyes are one of the most sensitive areas on the face, you must be gentle at all times, otherwise wrinkles will form easily !! Avoid rubbing or you will irritate the eyes area. Overall, I like the pretty packaging a lot!! It does a good job cleaning my eyes.. however in terms of the size.. I don't use it a lot but they do run out fast !